What Is Wrong With Our Economy? "The modern banking system manufactures money out of nothing. The process is perhaps the most astounding piece of sleight of hand that was ever invented. Banking was conceived in iniquity and was born in sin. The Bankers own the earth. Take it away from them, but leave them the power to create money and control credit, and with the flick of the pen they will create enough deposits to buy it all back again. However, take this great power away from them, and all the great fortunes like mine disappear, and they ought to disappear, for this would be a happier and better world to live in. But, if you wish to remain the slaves of Bankers and pay the cost of your own slavery, let them continue to create money and control credit." Ask yourself why we should have such poverty in the land of plenty when technology has brought such incredible production leverage in agriculture and industry. If we run our economy efficiently, we need less than 10-20% of our workforce to produce all of our nation's goods and services. 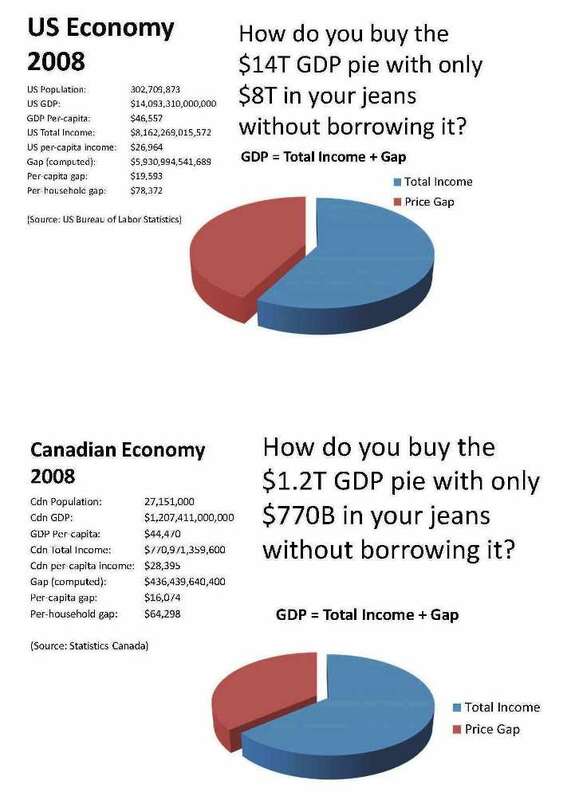 There are primarily two problems with our economy. fundamental gap or shortage of purchasing power. 2. The second problem is unjust usury. Let us first explore The Gap. The wealth of the nation is not money. Money is just a piece of paper or a record in a computer file. Our real wealth is the goods and services we produce year in and year out. As that wealth is produced, wages and dividends are created to reward our productivity. The goods produced and services offered need to have a price set that will allow producers to pay all their costs and earn a profit. That price is comprised of two important components --- (a) money paid as wages, earnings, profit and dividends, and (b) all other costs. then PRICE = A + B. So how big is this gap in the real world? Almost all money that comes into existence is issued as a debt to someone, and it must eventually be repaid. This debt money is issued by banks in the form of loans in order to fund new issues of stock, mortgages, car loans, various forms of credit, government bonds, treasury bills, etc. The problem is that interest must be paid on this debt; however, the money to cover that interest is never issued. Thus the pool of loan money is like musical chairs where somebody will eventually come up short. One cannot issue a dollar and demand repayment of two without also creating and issuing the second dollar. This is the primary cause of bankruptcy. 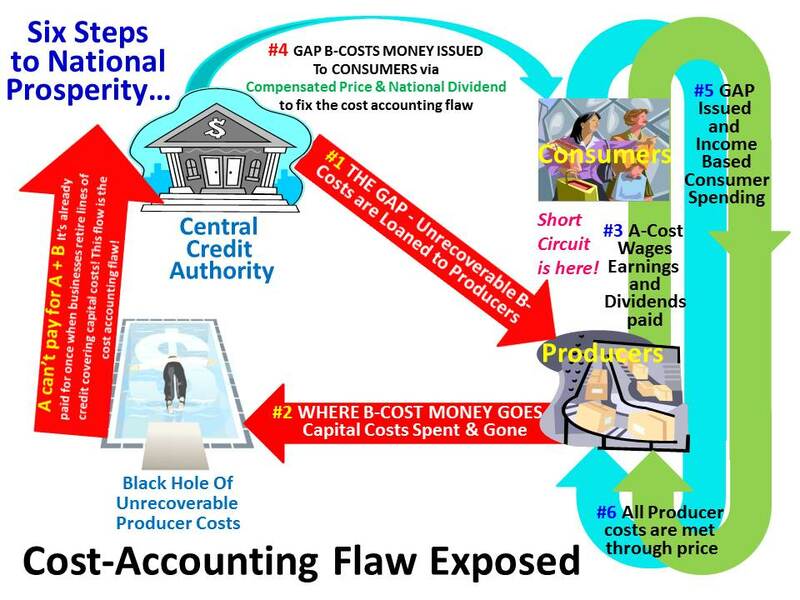 It is critical to understand that the first problem, The Gap, is the real problem with our economy; however, it is this second and apparent problem (which is really debt slavery) that everyone can see. This allows the "powers that be" to keep people in darkness because very few have successfully connected the dots. If you can grasp this one simple fact, you will forever be immune to economic deceptions or falling for schemes that lead right back into debt slavery. It has been said, "Are you a slave? Then be a good slave. However if you can be free, be free!" It is obvious that we have been content to be slaves up to now. The solution to the problems of our economic system is actually simple. Freedom from this economic slavery is not hard to gain if enough people can wake up and take appropriate action. We just need to set a vision in our mind of what is not working, then set another vision of what to replace it with. As surely as the thought "the wood floats" leads to "we have ships," our new economic vision will lead to a new and better Economic Democracy! If we think of the way the world's economies work as being like the game of Monopoly where the banker always wins, the only logical conclusion is to simply change the game. The game we all should instead play is called the Wealth Pumps. In this game, there are no booms or busts, price gaps or taxation. If this sounds impossible to you, there is something you do not know that you need to find out. You need to find out how this new Wealth Pumps game works! Buy your own personal a copy of my book: Economic Cures "They" Don't Want You to Know About to get the whole story.